AS Monaco have wrapped-up their first Ligue 1 home win for the season and we believe that Golovin is the man to help them avoid relegation. AS Monaco have an absolute nightmare of a season and they are currently on the 18th place on the table. However, a positive change seems to be expected, as the last weekend they won their first league game since the 0-2 victory at Amiens on December 4. Aleksandr Golovin and the new addition, Cesc Fabregas secured their first home win for the season. The French Champions for 2017 had a poor start of the season, as they sacked Leonardo Jardim and replaced him with Thierry Henry. 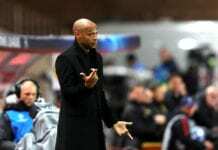 It was the first managerial job for “Titi” and it wasn’t a one that he’ll be proud of. Henry has been sacked with just 104 days in charge. He won only four of the 20 games as AS Monaco manager. Leonardo Jardim has been re-appointed and the Portuguese manager has only one goal at the moment: saving the team from being relegated. AS Monaco’s board made 8 signings in the January transfer period, with Cesc Fabregas and Gelson Martins as their main reinforcements. Regardless of the signings, we believe that Aleksandr Golovin is the man to rescue Monaco’s season. The 22-year-old arrived in France for a fee of €30 million from CSKA Moscow. Golovin played a fantastic World Cup tournament for Russia. He scored one goal and noted two assists leading the host to the quarter-finals of the competition. He was heavily linked with a move to Chelsea after the end of the World Cup, as Roman Abramovic admires him, but Monaco beat the London blues for his signature. Leonardo Jardim described him as the club’s “most important signing” back in September. Golovin missed the first five games tough due to the sprained ankle injury he suffered in August. He struggled to adapt and his most notable contribution in the first half of the season was a bizarre red card against Lyon only 10 seconds after the break. He missed the next four games due to suspension. However, the Russian attacking midfielder seems to get back in form, as he scored in the last 2 games for the club. Golovin was one of the best players at their home victory against Toulouse last Saturday and he is expected to keep his good performances. His goal against Guingamp was a beauty and that is exactly what he is capable of. Leonardo Jardim was the manager who convinced him to sign for Monaco in the first place, and with his re-appointment, Golovin is expected to play on his preferred position. Jardim believes in the 22-year old, which should boost his self-confidence even more.